For those who aren’t familiar with the phenomenon known as Candy Crush Saga – it is an incredibly addictive game played on the computer. I resisted the impulse to start the game for the longest time, then played for a while, and then gave it up cold turkey. I started playing again a couple of weeks ago. 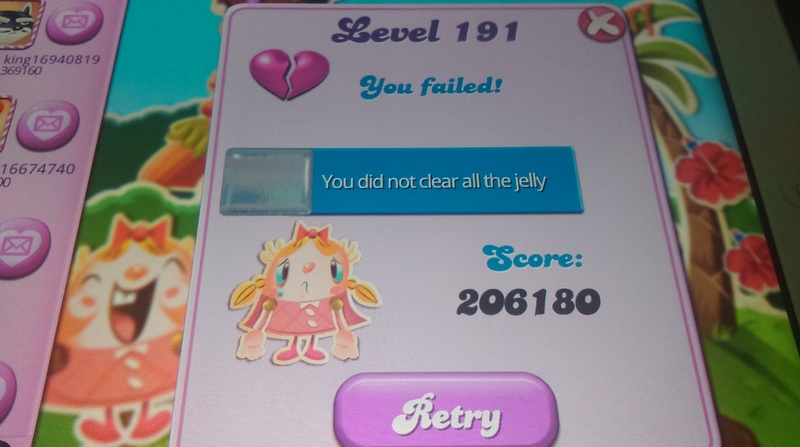 Although playing Candy Crush Saga can be a tremendous waste of time, I have learned several valuable life lessons while playing. 1. Candy Crush Saga can be a tremendous waste of time. If you have obsessive-compulsive tendencies (I’m raising my hand here), you have to be careful. The lesson learned is that everything is best done in moderation. Not the first time I’ve had to learn this and certainly not the last. 2. A saga is defined as “any very long story with dramatic events or parts”. Like the game, life is a saga, albeit a much more serious and important journey. Even so, I shouldn’t take everything so seriously that I don’t enjoy the trip. I need to make time for fun and games! And, sometimes like the game, life’s journey seems impossibly long and difficult. Reaching the “end” of Candy Crush is not the point. Playing the game is the point. I need to enjoy (or muddle through) each level as it comes and not worry so much about what’s coming up next. 3. Each level gets progressively harder although some easy ones show up every now and again. One thing to remember is that a level that’s easy for one person may be difficult for someone else. None of us are good at everything, but we all have something that we are good at. Once you’ve completed one level you’ve learned a skill that will come in handy later on down the road…like in life. There’s a reason we didn’t start with long division in elementary school. I need to be patient with myself. Sooner or later, I’ll get the hang of whatever skill I’m trying to master and be able to move on. 4. In the game, you are able to “gift” other players with extra lives so they have more chances to win a level. As you get to each new section of the game, you need help from other players to open the level. It’s much more difficult to play the game without the help of others. Life works the same way…it’s almost impossible to move through life on your own. Family, friends, a support group of one kind or another makes the journey possible. 5. Insanity has been defined as doing the same thing over and over again and expecting different results. After a lot of frustration, I realized that if I’ve been stuck on the same level of Candy Crush for days that it’s just possible that I need a new strategy. If trying the same moves over and over again isn’t working, rethink the way I’m playing. If I’m “stuck” somewhere in life and the problem isn’t being solved then I need to take a step back and reevaluate what I’m doing! 6. Finally, there is a certain element of luck in Candy Crush. Every once in a while, the pieces just fall into the right pattern and the level practically solves itself. I equate this to fact that I can’t control everything in my life. That may be an understatement. Sometimes bad stuff happens – the pieces don’t fall into place the way I’d like. But, sometimes things just work out and it’s not because I was particularly skilled or deserved the lucky break. I don’t have control of everything and I can’t work hard enough or try hard enough to fix everything and make it right. You do have to keep playing the game in order to move along. Giving up is one sure way to make sure that you don’t make any progress at all. 6. And finally, there is always someone farther along in the game than you are (and someone behind you). Sometimes somebody passes you by. You can’t worry too much about where everybody else is – in real life we call this “keeping up with the Jones”. It’s important to live with intention and find your own definition of success. Otherwise, you find yourself back at Lesson #1 and find that you are wasting a tremendous amount of time on something that really isn’t that important at all.